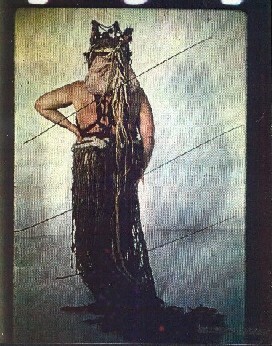 Gargan is the only action figure from Kenner's original line that was never produced in any form and the character can briefly be seen in Return of the Jedi as the large dancer in Jabba the Hutt's palace. The figure never got past the preliminary development stages and only made it to the hardcopy phase which allowed Kenner to create some in-house samples for photography and approval. 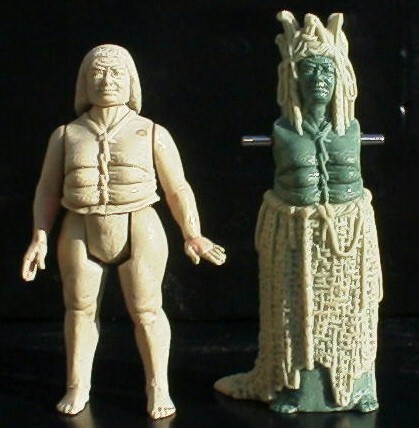 Lucasfilm wasn't too thrilled with the idea of an action figure of an alien prostitute and they quickly axed the idea. Kenner could have saved themselves the time and expense of creating these prototypes had they simply gotten Lucasfilm's thoughts on the idea. However I, for one, am glad they took the initiative and created this piece because it is really interesting to see a vintage Kenner Star Wars that looks so close to being finished, yet never saw the light of day. 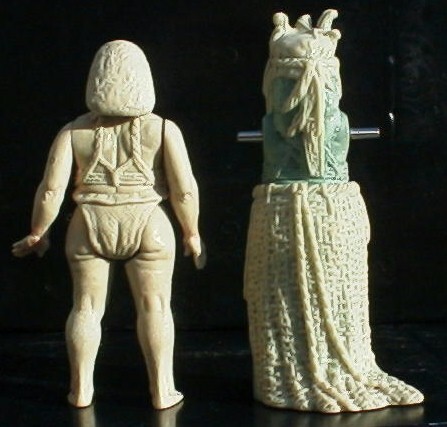 The figure sculpting is much like a normal one, but the piece on the right shows how the headdress and skirt were created. A Dynacast hardcopy of the torso and legs were made, but the silicone mold was altered so that a large portion of urethane would enclose the legs. Only the toes of the feet protrude from this chunk and allowed a full skirt to be sculpted in wax on top of the urethane material. The headdress was created much in the same way and the next step in the process would be to create a mold of this new accessory sculpting which was now part wax and part Dynacast. From here, a figure hardcopy could be placed into the mold and the urethane or rubber could be poured inside filling the void between the accessory sculpting and the figure hardcopy. This procedure would ensure that the accessories fit snugly on the body parts. 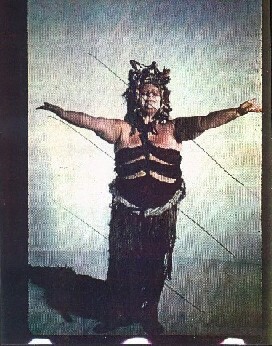 Notice the ridge around the waist of the figure which would have been used to help hold the skirt in place. 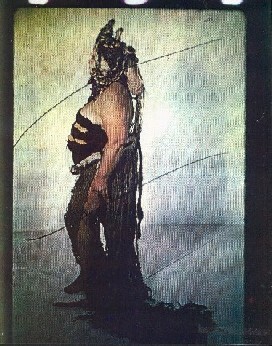 The skirt was designed to be trapped by the joints of the hip and would have not been removable by the customer. Shown above are color copies of reference photos taken from Lucasfilm and sent to Kenner. Notice that they have been crossed out in pen which was done on the photos, not on the copies. This defacing was typically done with reference material sent from Lucasfilm to vendors. The vendors could work from the reference photos, yet the marking was done to deter unauthorized publishing. Lucasfilm is one company that has always strictly protected their copyrights. Click on the images to see the full sized photos. If you look carefully you can see that these photos appear to have been taken directly from film, at one point, because the filmstrip notches can be seen top and bottom. Only three other examples (or parts thereof) of this figure have surfaced and can all be seen in our Unproduced Toys gallery under the Gargan title. The final image on that page is a composite photo created from the existing ones showing what the complete figure would have looked like had it been manufactured. Another interesting tidbit of information is that, early in their Power of the Force collector's coin development, Kenner was considering the inclusion of Gargan as one of their preliminary designs. Since the figure was rejected, so was the coin, but the proposed artwork is quite striking and based on the photograph above. The decision to create the coin suggests that this figure may have been slated for release during the Power of the Force series, but it could have been part of the last series of Return of the Jedi figures instead. The dividing line during this time period is fuzzy.